The mountainous state of Colorado features some of the most beautiful vistas in the continental United States. Sitting at the foot of the Rocky Mountains, the state’s capital, Denver, provides residents and visitors easy access to hills and slopes that offer mountain biking, skiing and hiking opportunities — but such activities do carry a risk of injury. And because they’re often in highly inaccessible or very remote areas, if there is a medical emergency, evacuation by helicopter is often the best, if not only, option. With four aircraft across four bases in Colorado and one in Wyoming, AirLife Denver is well placed to respond to such calls for help. 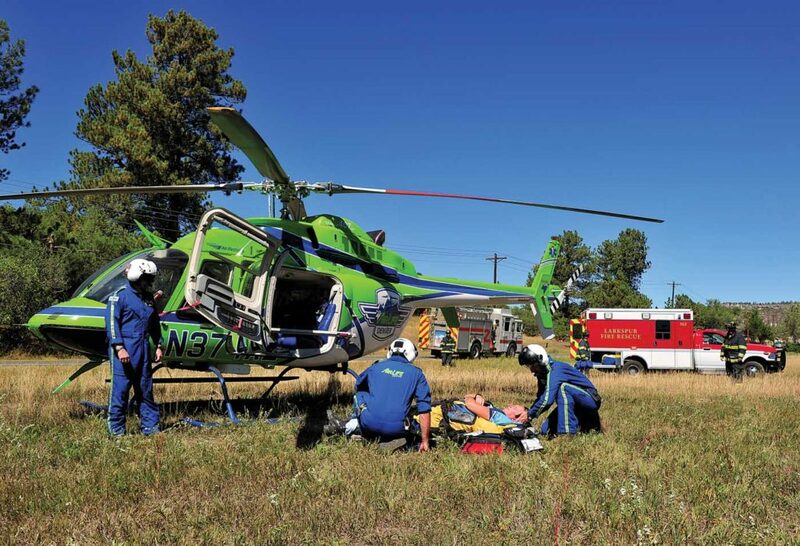 The emergency medical/critical care transport service of the HCA-HealthONE system of hospitals, clinics and surgery centers, AirLife Denver provides air and ground critical care transport for both adult and pediatric medical/trauma patients. 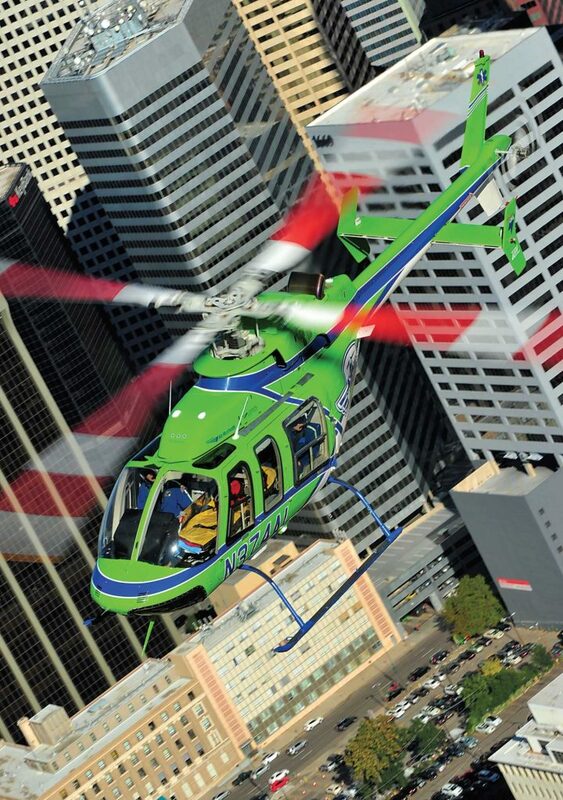 Bell 407 that replaces the aircraft’s original Rolls-Royce 250-C47B with a 1,021-horsepower Honeywell HTS900. 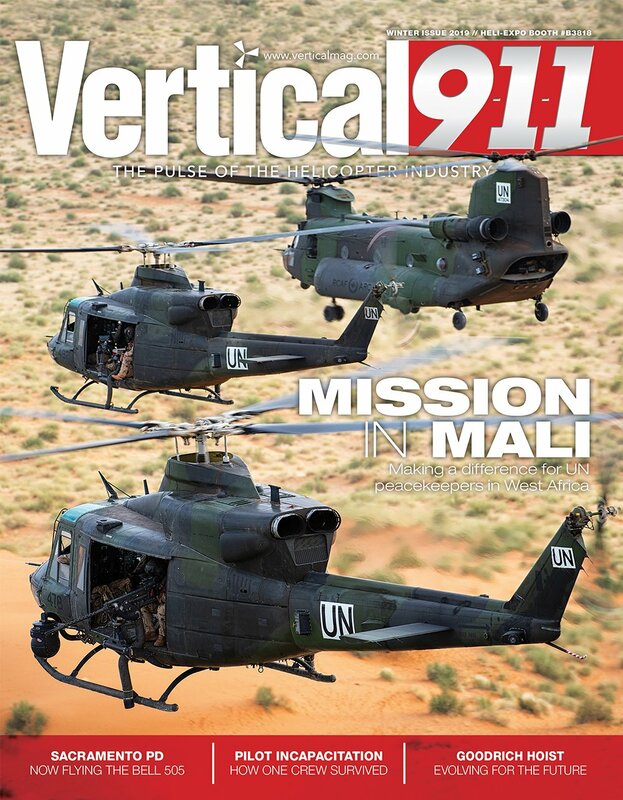 The aircraft are owned and operated by Air Methods Corp.
Last year marked the 35th anniversary of AirLife Denver’s rotary-wing operations, during which time it has completed over 65,000 missions. Its maiden transport flight, on May 9, 1983, saw a Bell 206L-3 LongRanger fly from Denver to Durango, Colorado. AirLife Denver completed 207 missions during its first year of service, including both on-scene and inter-facility transfer flights. The following year, it added a second Bell 206L-3 and a fixed-wing aircraft to its fleet. It also started a communications center, and added a high-risk obstetrics team to the flight crews. Other capabilities were added as they were developed over the years, including an intra-aortic balloon pump team and a neonatal team. The retirement of the organization’s faithful LongRangers in 1997 was followed by the debut of new and more capable Bell 407s. But while these have proven a great fit for the organization’s operations, AirLife saw an opportunity to enhance its fleet with the arrival of the Eagle 407HP conversion on the market — and brought the first of the type to work in emergency medical services (EMS) into operation in July 2018. The organization’s rotary- and fixed-wing pilots are employed by Air Methods. 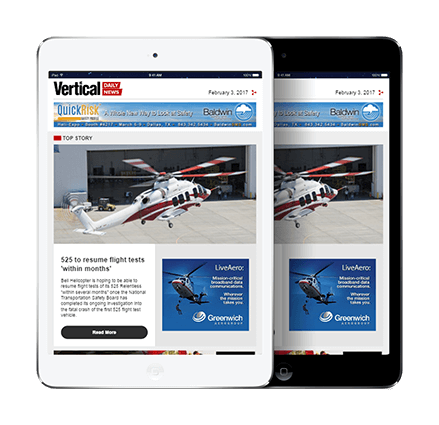 Each rotary-wing pilot must pass annual checks in both instrument flight rules and visual flight rules environments. 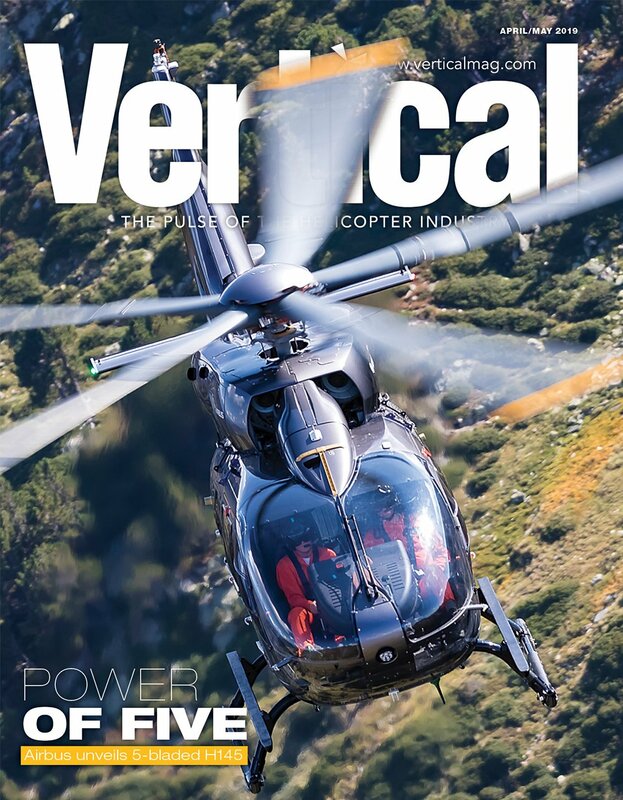 To fly in the Rocky Mountains, AirLife Denver’s pilots are required to have demonstrated mountain-flying ability, the skill to operate in “hot and high” environments, and an understanding of extreme winter mountain operations. The experience level is high, with many of the pilots at AirLife Denver having been with the program for over two decades. 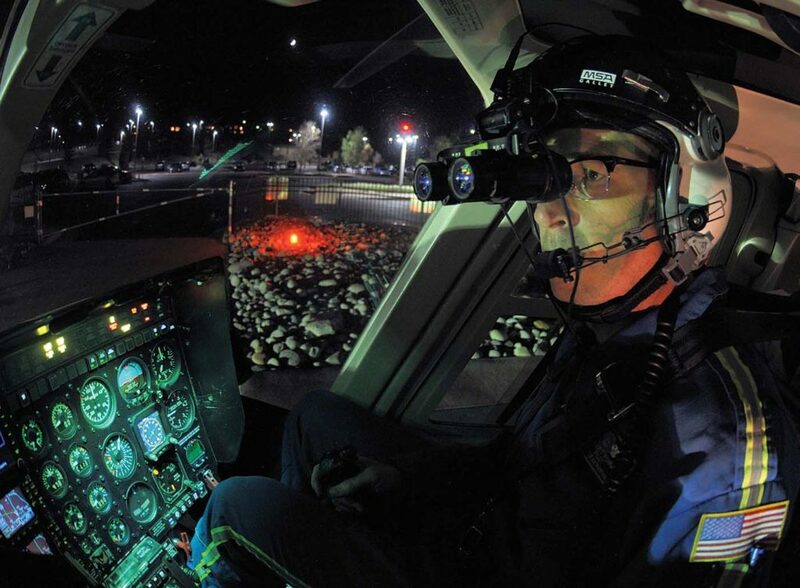 All AirLife Denver’s aircraft are equipped for use with night vision goggles, and the program’s crews use these regularly in operations. 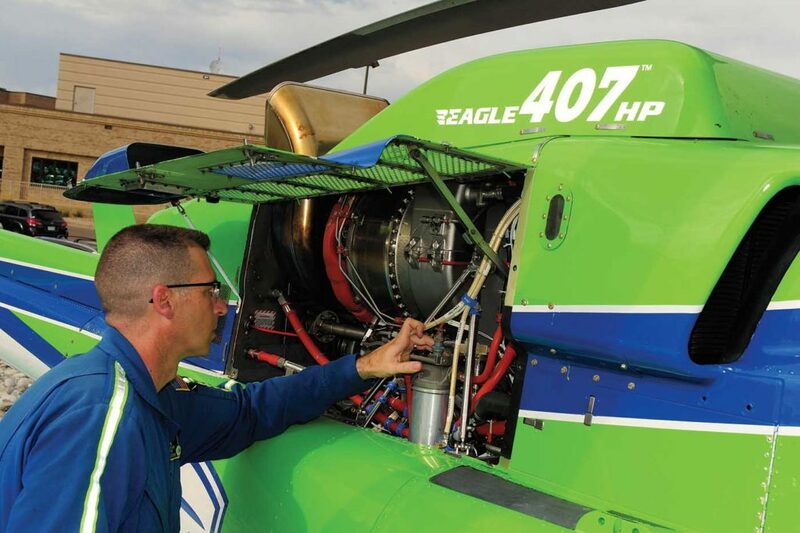 Cayce Batterson, lead pilot at the AirLife Denver Frederick/Firestone base, said the 407HP’s performance helps make the crews better able to cope with the variable conditions sometimes found in and around Denver. It’s just one of the reasons Batterson and his crews have been impressed with the new aircraft. Temperatures in Denver can be at or near 100 F (38 C) in the summer, while landing zones in the mountains range between 7,000 to 14,000 feet (2,130 to 4,260 meters) with many requiring a vertical takeoff. 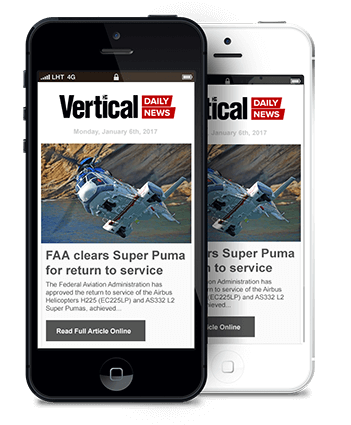 The vast majority of the organization’s operations require out-of-ground-effect capability and vertical takeoff/landing performance, said Batterson. AirLife Denver pilot Greg Poirier was similarly enthusiastic about the new aircraft’s performance. “I know that coming to work on even the hottest day in the summertime, the helicopter is going to do everything that I ask of it — no matter the temperature or the elevation,” he said. 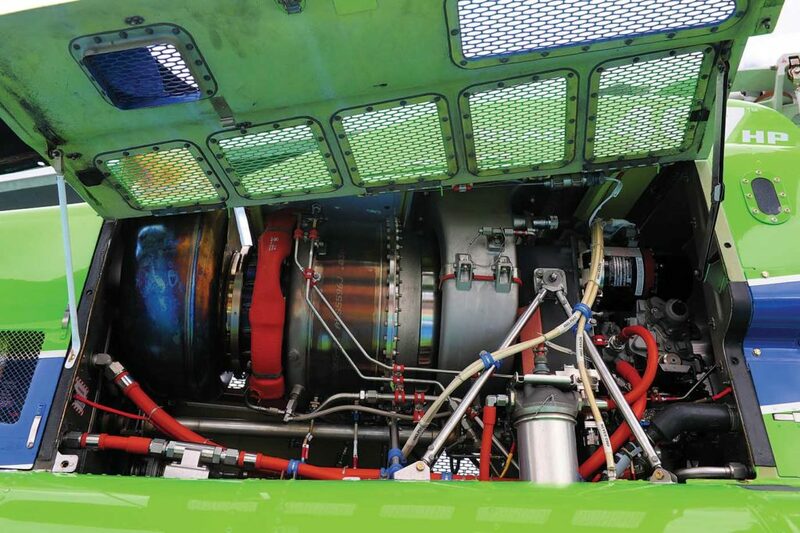 In the first six months of operation with the aircraft, the program recorded just over 200 hours on the engine. Poirier said AirLife Denver has not had any issues with the aircraft to date, but praised the “top notch” support Eagle Copters has provided. 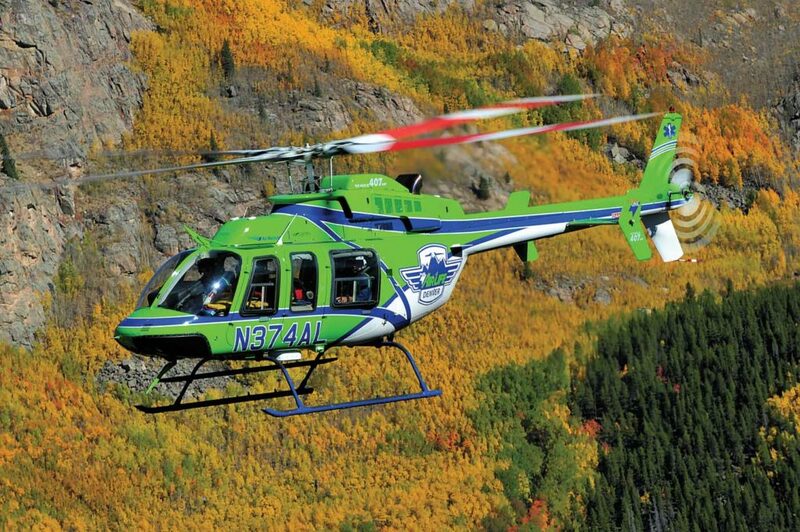 AirLife Denver’s helicopters are maintained by Air Methods, with dedicated and knowledgeable maintenance personnel. Each helicopter base has its own mechanic, and there are two float mechanics and two part-time mechanics available to support operations at the main maintenance base and to travel to other bases as problems arise. Each aircraft receives a minimum of three inspections from a mechanic each week, and any discrepancies are repaired at that time. Designated mechanics are on call 24/7 to address any discrepancies that may arise. While the 407HP as a type is still being learned, it is proving to be relatively trouble-free for AirLife Denver so far. Because of weather concerns during the winter, heavy maintenance and scheduled maintenance are performed inside a hangar. 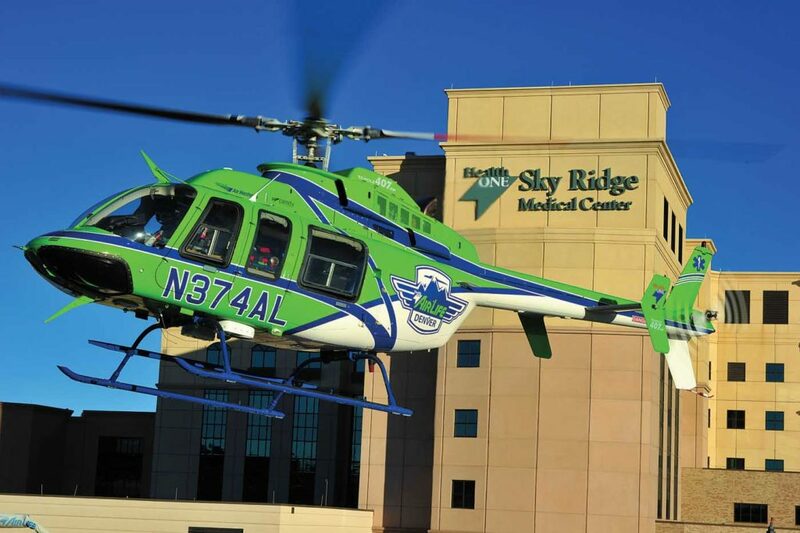 In the Denver area, AirLife Denver’s base at Sky Ridge Medical Center has a large hangar facility that is perfect for this type of maintenance, while its base at Cheyenne Medical Center in Wyoming also has a hangar when needed. 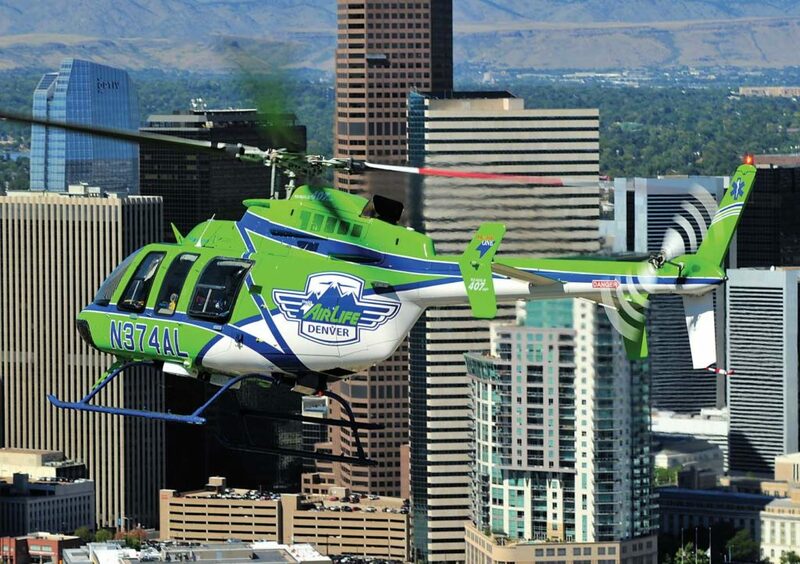 AirLife Denver’s other bases are all in Colorado: at Frederick-Firestone Station 2, Lincoln Community Hospital, and Holyoke Melissa Memorial Hospital. Generally, the helicopters travel about 150 miles (240 kilometers) from their bases. For longer distances and interstate flights, AirLife Denver operates two Air Methods-supported King Air 200 fixed-wing aircraft, based at Centennial Airport in Denver. These aircraft take AirLife Denver’s reach across the country, but most of its flights are to the western states. AirLife Denver operates across Colorado and Wyoming, with its eastern bases reaching into Kansas and Nebraska. It flies to landing zones and hospitals that require a vertical takeoff and landing at elevations as high as 10,000 feet (3,050 meters). In the summer months, AirLife Denver’s crews are challenged with high density altitudes and fast-moving thunderstorms that roll off the continental divide and strengthen as they move over the plains. In the winter, typical challenges include low clouds, low visibility, fast moving snowstorms, and extreme winds. It is common to see lenticular clouds forming over mountain peaks and have wind gusts of over 50 knots around the continental divide. And the weather can change quickly. Survival kits and a personal locator beacon are kept on the aircraft year-round, with snow shoes added during the winter. Crews also bring their own heavy jackets and other survival gear, such as basic survival equipment, food bars, a knife, a locator beacon, gloves, hand warmers and caps. AirLife Denver bases perform more flights in the summer months, but they stay busy year-round conducting a mix of scene and transfer responses in the mountains, as well as in the open plains of Colorado and Wyoming. 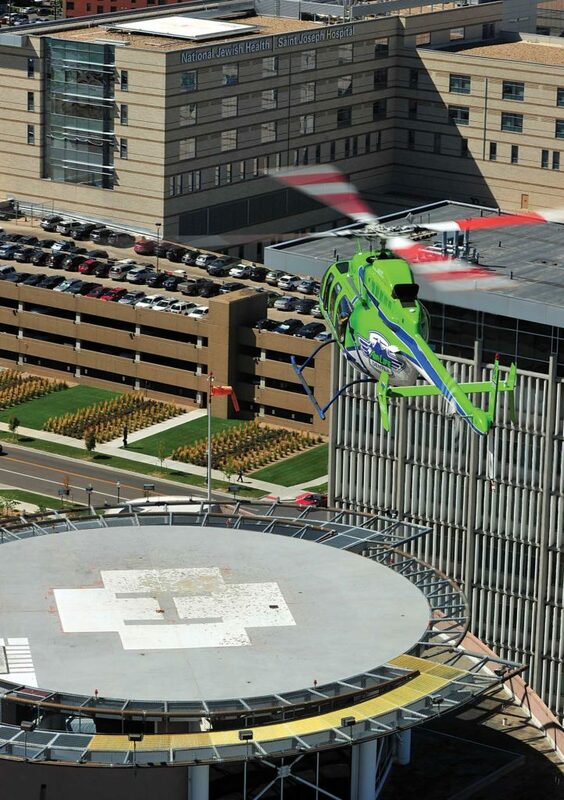 Typical scene calls can see the program responding to car accidents, climbing falls, mountain bike crashes, and horse riding accidents — as well as the entire spectrum of typical trauma and medical cases seen in any large urban area. Added to this are hospital transfers and specialty team cases that require flights for neonatal, high-risk obstetrics, and sick or hurt children. 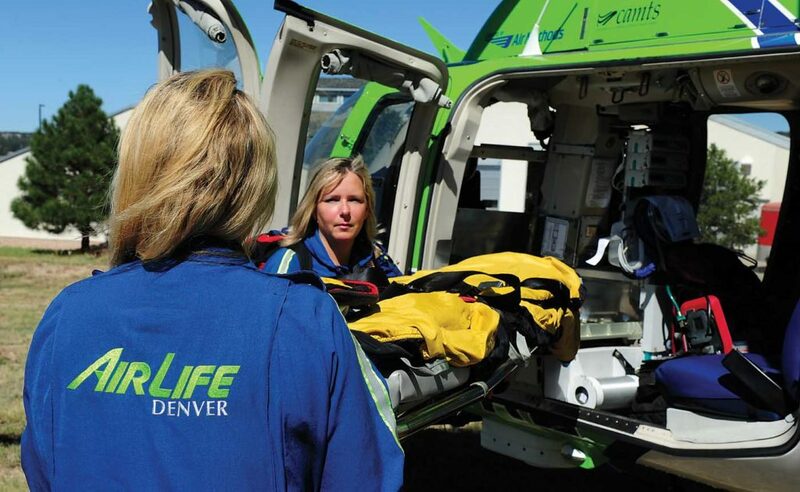 AirLife Denver typically uses either two nurses, or a nurse and a paramedic, for its medical teams, with each team member having at least five years’ experience in critical care, paramedicine and emergency nursing. Each new flight nurse/paramedic completes a comprehensive orientation program before joining the flight crews, including supervised transports utilizing all modes of transport as well as simulated training. The specialty transports of high risk obstetrical, high risk neonatal and intra-aortic balloon pump teams include two medical crew — either a primary flight team nurse, a specialty trained high risk obstetric nurse, nurse practitioner, or respiratory therapist. For scene calls, AirLife Denver medical crews carry backpacks loaded with medical gear, because they might have to hike into an area beyond where the helicopter can land. The crew also has to be in fairly good shape as they might have to a carry a patient back to the helicopter. The AirLife Denver medical teams very often work autonomously in performing advanced procedures and administering medications, based on guidelines and procedures developed by — and under the supervision of — AirLife Denver medical directors. AirLife Denver’s communications center is based at the Medical Center of Aurora-North Campus. Two communication specialists are on duty 24 hours a day, 365 days a year. The center has radios to communicate with the aircraft, map systems to track flying aircraft, and computers to control and monitor operations. For over 35 years, AirLife has covered Colorado and the surrounding areas with the aim of getting patients to hospitals as quickly and safely as possible, in often extreme altitudes and temperatures. And with the Eagle 407HP in its fleet, it is now able to do so in a much wider range of conditions.